Valentine’s Day isn’t just for couples anymore! Of course, if you’re a fella looking for the perfect gift to give, we’ve got you covered, but these ideas are also great for Galentines or if you’re practicing the very important art of self-love. No matter who you are or who you’re treating this February 14th, we’ve got some easy DIY gift ideas for you! 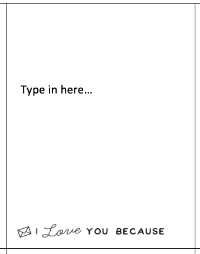 Download the word template by clicking the preview of the template and customize 52 cards (you’ll need six and a half pages) each with a different reason you love your valentine. Think of the little actions they do, the parts of their personality that you admire, and specific memories only they could have shared with you. Of course, we can’t love anyone else until we love ourselves so if you’re treating yourself this Valentine’s Day, use this opportunity to recognize the qualities you’re proud of. On hard days, coming back to these cards will empower you to move forward! Click here to download template! Once you’ve printed out and cut your 52 reasons, start trimming the color swatches to size. I didn’t use a ruler to measure, but roughly cut each swatch the long way into thirds. The first third is the side with text so trim that off and discard. The rest can be cut in half to create two mini-swatches of each color. Snip off all the white portions to get your individual pieces. Write 1-52 numbers out on each swatch. 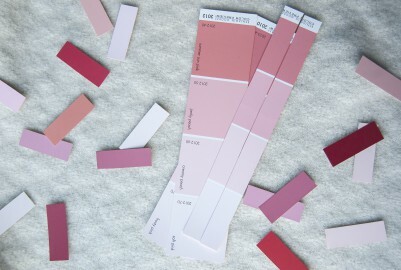 I like the look of mixing up the colors, but you could also make a beautiful ombre effect by organizing them just so. Layer a playing card on the bottom, a reason page in the middle, and a number swatch on top before stapling the pieces in place. 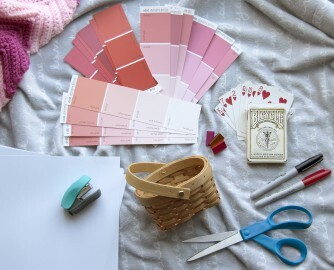 Using gold, pink, or red staples is another fun and easy way to introduce color! Organize the cards in your basket (or whatever little box you thrifted) and finish it off with a title card. Fold this over the handle and staple it in place! If you don’t have a handle, fold it into a C shape and tuck one end in front of the cards and the other behind. Voila! 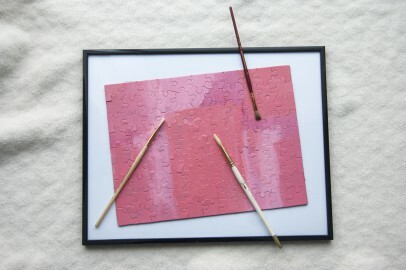 Assemble and paint the puzzle with whatever colors you choose. Go abstract, just letting the paintbrush do its thing while you mull over the perfect phrase for your art piece. I decided to use the title from one of our favorite songs by Penny and the Quarters, but if your valentine isn’t a partner, rephrase the words! Use an inside joke for a best friend or an affirming mantra to remind yourself of something positive every day. While your paint dries, use the Exacto knife to cut out the appropriate letters. Decide on the placement carefully before removing the adhesive back. When you’re sure you love your layout, and you’re positive the paint is dry, stick the letters on and frame your new art! I think the subtle puzzle shapes peeking through blush tones topped by stark black letters create a satisfying contrast. 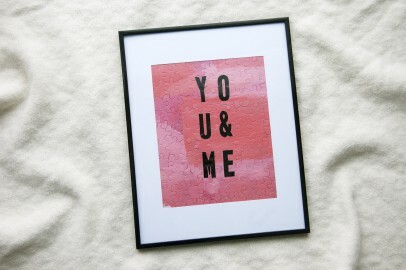 If you’re looking for another way to re-purpose puzzle pieces, check out this DIY card tutorial. 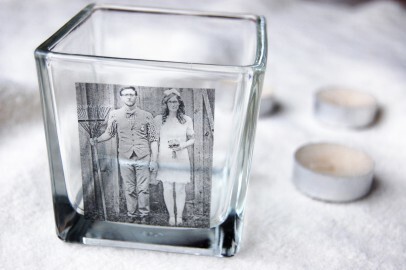 Finally, making some personalized glass votives would be a classy way to light up date night or brighten a friend’s home. Making these for yourself? Choose images that inspire you. This project works for any image (black and white or full color!) printed on a laser printer or cut from a magazine. Size your images appropriately and print them to get started. Then, thrift some glassware and watch the video below to find out how easy this customizable craft is. You could even place an image on the bottom of a clear glass plate to act as a jewelry holder or key catch! Step 1: Print your photos on a laser printer and cut to size. Step 2: Place a piece of heavy duty packing tape over the image. Be careful not to let any bubbles in. Gently press. Step 3: Trim the excess tape and paper. Step 4: Use a craft stick to “burnish” (rub vigorously) the entire image. Step 5: Soak the image in warm water for several minutes. Step 6: Use your thumbs to rub the gummy paper off the tape. Step 7: Allow the image to dry, then place on your glass and press. Use the craft stick again if necessary to thoroughly secure. Still stumped? Try a #GoodwillDate! Zip into your local Goodwill and buy a $10 or $15 gift card then tuck it inside a nice card explaining the procedure. This is a thoughtful present that you can give as an investment in the future of your relationship (or as a treat to yourself!). On Valentine’s Day, decide when you’ll enjoy the thrifting rendezvous no matter who your date is! 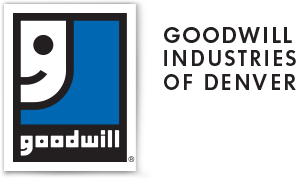 There’s one other sweet side effect of shopping at Goodwill this Valentine’s Day: its entrepreneurial business model of collecting and selling donated goods allows Goodwill organizations to help communities extend the life of usable items—like playing cards, puzzles, and glassware—in environmentally sound ways and prevent items from piling up in local landfills. Even better, right? We hope to see you soon!